What happens when all hail or hell breaks loose? - JP loves LIFE! What happens when all hail or hell breaks loose? 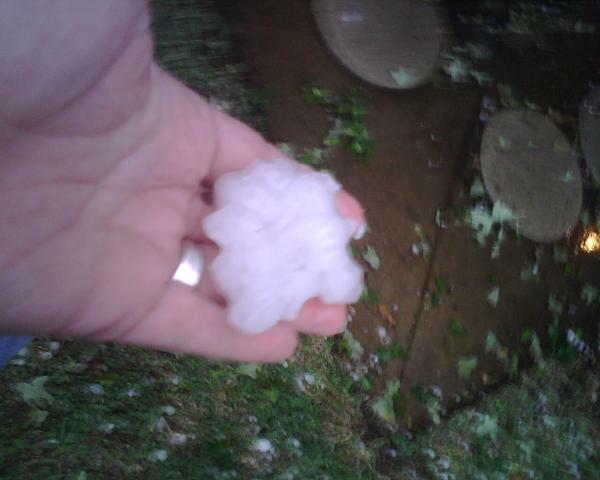 Hail this size dinged up my car before but can lead to farmers to replant or need to change crop management plans. This weekend's weather was far tougher south of Memphis. Yesterday, severe weather ripped its way across much of the central U.S. Hearts and minds immediately went out to the people who lived in the areas where forecasts included tornado warnings. No group of people understand the power of weather more than the farmers and ranchers that produce our food, feed and fiber. Farmers and ranchers benefit from the weather routinely. They also understand the potential of weather to bring incredible hardship to lives in the blink of an eye. That was certainly the case in this storm and others. Yazoo City, Mississippi is the kind of place that rarely makes the national news. In fact, it surprises people when it makes the national news and there’s a bit of wonder about how pronunciations will go. Its a small city, not far away from the state capital and having lived in the rural Mississippi Delta, I have been through Yazoo City many times. I can picture the drive south on highway 49 even as I tap this out. But this weekend’s news coverage, shows a very different place — photos of devastated homes, gas stations, fast food restaurants, etc. (Check The Weather Channel or the New York Times. And Yahoo has a few stories from AP, etc.) The loss of life is significant but thanks to the warnings received, I have to say it could have been greater. In a few days, weeks or months, the tornado will be forgotten by the vast majority of us — just like few of us think about the tornadoes that ripped through Oklahoma in 1999; or hurricanes Hugo or Ivan. But a lot of those storms forever changed the lives of individuals and forever changed small towns as well. I still remember when a tornado tore through a small town just miles away from my house in the Delta. The storms can be so personal in rural areas — everyone knows each other. So many relationships exist from families to sports, church to business. When you see one of those come through your immediate area, you may see houses that become abandoned or businesses that do not rebuild. The impact is felt for years and years. And every time you see a big storm headed someone else’s way, you hope they don’t face the same devastation. And you feel like you need to reach out to others and give them your best wishes. Our thoughts and prayers go to the folks who have this new pain. I hope the healing comes quickly. So what happens when all hail or hell breaks loose? Usually the hearts, minds and prayers of farmers and ranchers are among the first to go out to people in harm’s way. « Tiny Yard, Big on Gardening!